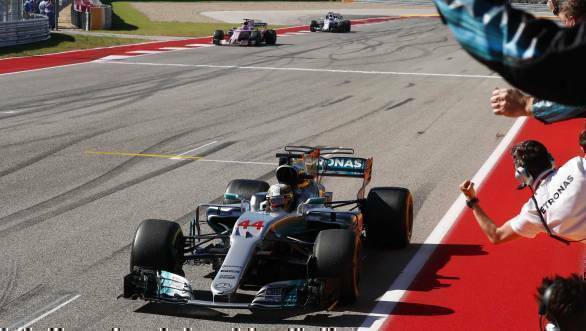 Lewis Hamilton's victory at the 2017 United States Grand Prix helped him further his hopes of winning this year's championship title. The British driver, who already has three driver's titles under his belt, took a fine victory in the race, ahead of title rival Sebastian Vettel. However, with Vettel managing to finish second, the championship battle now heads to Mexico. Third place in the race went to Vettel's Ferrari team-mate Kimi Raikkonen, after Max Verstappen was handed a five-second penalty for a last lap manoeuvre he pulled to slip into third. Hamilton has managed to extend his lead in the championship standings to 66 points over Vettel, which means that now there is a realistic chance that the title race will be wrapped up in Mexico. Mercedes AMG F1 has already sealed the 2017 Constructor's Championship title. 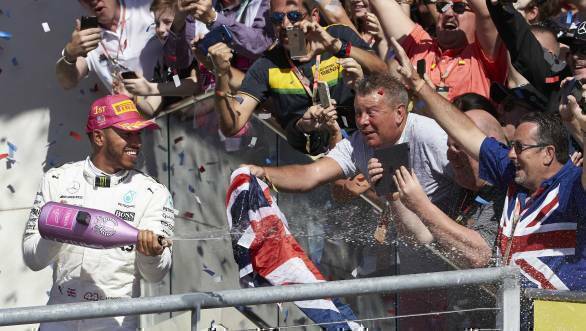 Lewis' US GP weekend got off to a perfect start, with fastest time in FP1, FP2, FP3 and pole in qualifying too. But when the race began, it was Vettel who got off to a better start from second place on the grid. The German driver took the lead on the run up to the first corner, and managed to eke out an advantage over Hamilton over the course of the opening laps. But, on the sixth lap of the race, with the aid of DRS, Lewis was able to reclaim the lead, after which he pulled clear of his title rival. While Ferrari chose to call Vettel into the pits early in a hope to undercut Hamilton, the Mercedes team kept their driver out longer. It nearly was advantage Vettel, as Hamilton emerged from his own pitstop with less than a car length between himself and the Ferrari. However, he was soon able to move clear of the German driver. Meanwhile, the man on the move during the race was Max Verstappen. Verstappen had set the sixth-fastest time during qualifying, but started the race from P16 thanks to a penalty. He worked his way up the order though, and on Lap 37 pitted for a second time, which caused other teams to rethink their strategy. While Hamilton and Vettel weren't threatened by Verstappen at that point, moving clear of the Red Bull, it was Kimi Raikkonen and Valtteri Bottas who were soon under pressure from the Dutchman. Bottas, who'd already fallen victim to both Ferrari drivers, was soon passed by Verstappen as well, after which Mercedes opted to bring him into the pits for fresh tyres. Here's Red Bull Racing's Max Verstappen not exceeding track limits. But another incident in the race, that involved gaining an advantage and overtaking Kimi Raikkonen, while all four wheels were off the white line, led to a penalty that stripped him off third place. Hamilton, clear of a threat from Vettel, crossed the finish line over 10 seconds ahead of the German. It was to be his sixth US GP win, and his fifth win at the Circuit of The Americas. Vettel took P2, keeping his championship hopes alive. Meanwhile, Verstappen was on a charge, making a move on Kimi Raikkonen and stealing P3 from him in the final sector. 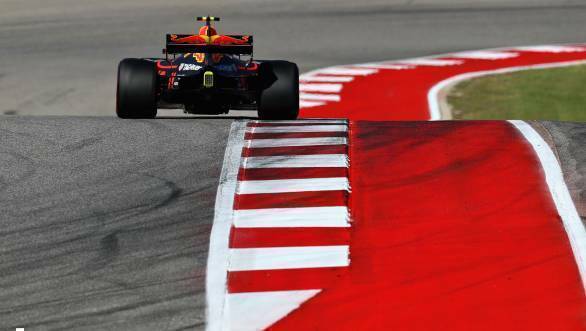 However, given that the Red Bull had all four wheels over the white line and gained an advantage, the stewards handed Verstappen a 5-second penalty, which pushed him back down to fourth position. What's more, they also handed him a penalty point on his license, a move that has been strongly criticised by several people within the paddock, from Niki Lauda and Christan Horner, to Verstappen himself. Bottas' fifth place finish was enough to secure Mercedes their fourth straight Constructor's title. While Esteban Ocon took sixth place for Force India. Carlos Sainz Jr had a good start with Renault, finishing seventh, while Sergio Perez put the second Force India in eighth place. Felipe Massa and Daniil Kvyat took ninth and tenth place respectively for Williams and Toro Rosso. Lance Stroll put the second Williams in eleventh position, with Stoffel Vandoorne taking 12th for McLaren, after team-mate Alonso retired with engine issues. Le Mans winner, Brendon Hartley, did a good job on his F1 debut, finishing P13 in the race, with Romain Grosjean 14th and Marcus Ericsson and Kevin Magnussen the last of the finishers.